The success of Pokémon's revitalization through the extremely popular Pokémon Go app might be spurring the redevelopment of another 1990's classic - the Tamagotchi. Class 041 for "Entertainment services, namely, providing non-downloadable computer games that may be accessed network-wide by network users via mobile phones and computers; providing non-downloadable computer games via network between communications networks and computers." Both classes were filed on an intent-to-use basis, meaning the companies are [probably] not using MY TAMAGOTCHI FOREVER in commerce yet, but have a bona fide intention to do so in the near future. The goods and services listed in this application sound a lot like some sort of mobile game. Will we soon be able to care for Tamagotchis on our mobile phone like we did on those rudimentary plastic eggs in the 90's? Will the app incorporate augmented reality like Pokémon Go? Will we see MY TAMAGOTCHI FOREVER in the App Store soon? Only time will tell. On July 7th, Marvel Characters, Inc. filed nine different federal trademark applications for what appears to be a Spider-Man logo (seen below). Marvel filed each application in a different class (hence the nine different applications for the same logo) and on an intent-to-use basis (meaning it is probably not using the marks yet). As I've blogged about before, putting each class on a separate application is likely a strategic move designed to ensure that a problem with one application does not hold up the others (as it would if all the classes were listed on one application). Some of the goods and services covered by these trademark applications include educational and entertainment services (Class 041), toys and games (Class 028), clothing (Class 025), and video game software and computer programs (Class 009). The broad range of protection sought for this logo suggest that Marvel might have big plans for it. Is this logo related to the Spider-Man: Homecoming movie that is currently being filmed? Not much is known about the film so far. However, early pictures from the film show Spider-Man on a bicycle, and the logo above looks strangely like a bicycle tire. Coincidence? Is This Trademark Application For a New Sam Adams Beer Logo? 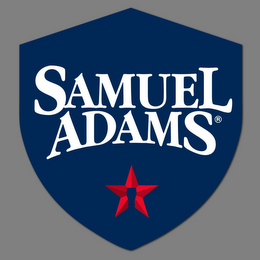 The Boston Beer Company may be re-branding the Samuel Adams line of beer with a new logo if a recent trademark application is any indication. On July 1st, the beer company filed a federal trademark application for the logo seen below in Class 032 for "[b]eer." The company filed this application on an intent-to-use basis, suggesting it is [probably] not using this mark in commerce yet, but has a bona fide intention to do so in the near future. 15 USC 1051(b). According to a quick search, Boston Beer Company owes 203 live federal trademark applications or registrations, most of which are for names of various beers, including the BREXIT application I blogged about last week. Recent federal trademark applications suggest that Sylvester Stallone may be penning a motivational book called STALLONE - BE FIRST. On June 30th, Boulevard Management, Inc. (a Hollywood business management firm) filed three federal trademark applications for the term on behalf of Rogue Marble Productions, Inc. (which appears to be affiliated with Sylvester Stallone and also owns trademark applications or registrations for SYLVESTER STALLONE, I MUST BREAK YOU, and CUT ME MICK, among others). How do we know Sylvester Stallone is affiliated with these applications (beyond the fact that the owner of the applications appears to be an entity affiliated with him)? A declaration signed by the actor and consenting to these registrations was submitted with the applications (see above). Section 2(c) of the Trademark Act requires such a declaration any time a trademark application filed with the Trademark Office contains the name, portrait, or signature of a living individual. See also TMEP 1206 et seq. Class 016 for "[b]ooks, guides, handouts and resource materials in the fields of sports, physical fitness, entertainment, inspirational and motivational subject matter[;]"
Class 025 for "[b]ottoms; Footwear; Gloves; Headwear; Loungewear; Sweatbands; Tops; Undergarments[.]" These applications were filed on an intent-to-use basis, so a specimen showing actual use of the mark in commerce is not available at this time. However, the applications do suggest that Sylvester Stallone may be in the process of developing an inspirational and motivational book (and related apparel) titled STALLONE - BE FIRST. Stallone fans - keep an eye out at bookstores near you.